It’s no longer easy to say whether it’s safe to give even a small amount of peanut butter to your dog. And there's a one-word answer as to why... Xylitol! Xylitol is an increasingly common sugar-replacement sweetener that's in hundreds of products, including some brands of peanut butter. It's an “all natural” sugar substitute that’s fine for people, but it’s extremely poisonous to dogs and poisons thousands of dogs each year. We at Preventive Vet are happy to report that there has been an increase in awareness about xylitol - both in peanut butter and in the more than 700 other products xylitol is found in - and we have been able to influence some companies to change their labeling and warning practices. (Skip to the end of this article to see the progress made so far.) But there's still far-too-many people that remain unaware of the very severe danger that xylitol poses to dogs, and so we all must do everything we can to continue to raise awareness and affect the important changes that will save dog lives and dog lover heartbreak. Xylitol is a sweetener that's gaining in popularity because of its dental benefits for people as well as its suitability as a sugar substitute for people with diabetes. Yet thousands of dogs are accidentally poisoned by xylitol every year. In fact, the toxic dose of xylitol in dogs is even less than chocolate! For example, as little as 1.37 grams of xylitol can cause a rapid drop in a dog’s blood sugar (“hypoglycemia”) and result in staggering, disorientation, collapse, and seizures in a 30-pound dog*. If a dog of the same size ingested 6.8 grams, it could be enough to cause a debilitating and likely deadly destruction of the dog’s liver cells. Now consider that it would take about 22 times more (150 grams) dark chocolate to result in the same level of severe toxicity. The increasing popularity of xylitol as an ingredient in a growing number of products — including gums, mints, chewable vitamins, ice creams, common supplements, and many others — highlights the importance of reading ingredient labels, as well as the danger of assuming that what's safe for you, or even your kids, is also safe for your pets. See our list of over 700 products that contain xylitol — many will surprise you! What Type of Peanut Butter is Best for Dogs? Generally speaking, any peanut butter that doesn’t contain xylitol (or chocolate) should be fine for a dog. It can be a good source of protein and healthy fat for your dog — in moderation, of course. However, some peanut butters are healthier than others. A lot of peanut butter you find on the shelves has good qualities when it comes to your dog, but probably contains preservatives and extra sugar that aren’t great. Your best bet is to find a peanut butter (or other nut butter) that is low on or completely free of additives. 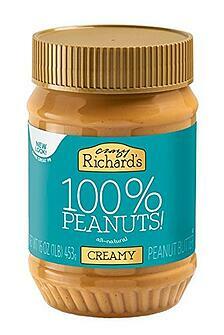 This peanut butter made by Crazy Richard's lists just one ingredient: peanuts. Or, if your grocery store has a natural foods section, look for a peanut grinder so you can take home one ingredient peanut butter. And read labels and ingredient lists carefully — don't assume that "all natural" or "no artificial sweeteners" on the front label means it'll be safe for your dog. Xylitol is technically an "all natural" sweetener! 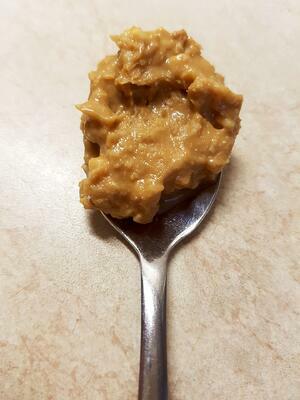 If you have a decent blender or food processor, you can easily make your own peanut and nut butter at home! It will be healthier for your dog and they won’t know the difference. If you want to make a great homemade nut butter here's a recipe from our friends at Show Me The Yummy. The recipe includes notes to make it dog-friendlier by cutting down on or eliminating ingredients like salt and sugar. Teddy, the photogenic dog in our article, is their nut butter taste tester. Enjoy! 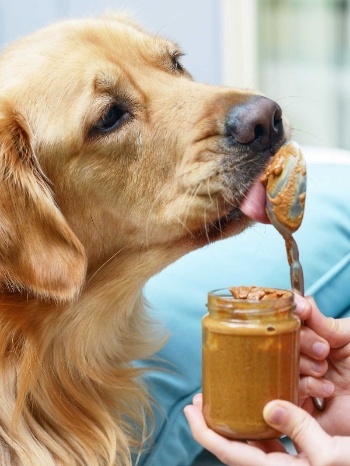 How Much Peanut Butter is OK for Dogs? A little bit of xylitol-free peanut butter for your dog will likely be perfectly fine — overdo it though, and you can give your dog a nasty (as well as painful and expensive) case of pancreatitis and/or contribute to obesity. So you need to be careful how much peanut butter you give your dog — or any treat for that matter. The rule of thumb is to give no more than 10% of your dog’s daily calories in treats. * Note that in dogs with chronic pancreatitis or those at increased risk for developing acute or chronic pancreatitis - like Miniature Schnauzers and Yorkshire Terriers - even a very small amount of a high-fat treat like peanut butter may be enough to bring on or worsen their pancreatitis and should be avoided completely. Creamy or Crunchy Peanut Butter for Dogs? You may have read that crunchy peanut butter can be a choking hazard for dogs. This is pretty unlikely, unless you’re giving a very small dog a very large amount of crunchy peanut butter. But as you learned in the section above, even a decent-sized dog should only be allowed about a tablespoon of peanut butter per day, so it’s unlikely you’ll give enough at any one time to present a choking hazard. So go ahead and give your dog whichever peanut butter—creamy, crunchy, super crunchy, or any other variation — you have. Creamy peanut butter tends to be easier to smear if you plan to use it to distract your dog during a bath (you can smear peanut butter on the bathtub/shower wall to distract your pooch) or while trimming their nails (you can smear peanut butter on a plate so your dog will be so busy licking they won’t notice or care that your cutting their nails). Is Peanut Butter and Jelly OK for Dogs? Peanut butter is one thing, but jelly should be off-limits to your dog. Why? First, there’s a lot of sugar in jam, jelly, and preserves — if you’re already giving your dog peanut butter, adding extra sugar will further increase the risk of obesity and diabetes. Second, some jelly contains dog-dangerous xylitol. Third, some types of jelly are made from fruits that you shouldn’t give your dog. For example, while strawberry jelly may not be toxic to dogs, grape jelly could be. Grapes are poisonous to some dogs and can cause acute kidney failure. The same goes for raisins and currants. Either way, it's best to hold the jelly and jam when it comes to treating your dog. Can Dogs Be Allergic to Peanuts? Unlike some humans, dogs do not appear to have an allergic reaction to peanuts. I’m not aware of any documented cases of allergic or anaphylactic reactions to peanuts in dogs, nor to other nuts or seeds for that matter. But that doesn’t completely rule out the possibility. So, if it’s your dog’s first (or second) time having peanut butter, or another nut butter, and you’re concerned, give them just a small amount to start (like a lick off the tip of your finger) and keep an eye on them. Concerning signs to watch for are listed below. As long as you don’t see any of these signs within about an hour, you’re likely OK.
We will continue to reach out to companies that use xylitol to discuss this dog hazard and try to get formula changes or, at least, increased awareness on their product packaging and websites. Below is a summary of the successes so far in getting brands to remove xylitol from their products or do a better job of notifying pet owners about the potential dangers. Update (April 2018): The list of peanut and nut butters that contain xylitol is back UP TO FIVE! On April 12, 2018, we received a "xylitol-containing product submission" from a pet lover who was reading our Which Products Contain Xylitol list. They brought to our list a peanut butter spread company that uses xylitol in their spreads. The company is called No Cow (previously called D's Naturals) and their Fluffbutter spreads contain xylitol - so please be sure to keep them far away from your dogs and help spread the word. Update (August 2017): The list of peanut and nut butters that contain xylitol is now DOWN TO FOUR! *On August 3, 2017, we received a message from Hank Capasso, of Hank’s Protein Plus Nut Spreads, announcing that he had taken the wonderful step of removing xylitol from his company’s peanut and other nut butters. We have checked their labels to confirm that their nut butters no longer contain xylitol and have removed them from our list of xylitol-containing products. 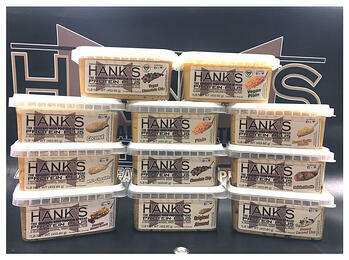 We’d like to extend our sincerest thanks to Hank and the rest of the team at Hank’s Protein Plus Nut Spreads for taking this fantastic step toward protecting dogs from the dangers of xylitol. Update (August 2015): We have been in discussions with Nuts ’N More and they have agreed to take some good initial steps to improve awareness of the hazard that xylitol poses to dogs. They have added a new warning about the dangers of xylitol to dogs in the "What Is Xylitol?" section of their FAQ page (though note that there truly is no “maybe” about it, xylitol IS dangerous to dogs). The even bigger news is that they have agreed to add a “not for pets” warning on all of their xylitol-containing product labels, and they have also agreed to disclose the amount of sugar alcohol per serving on the new labels! This is great awareness and will help tremendously, both to keep these products out of the mouths of dogs and also to aid in the treatment of those dogs who do get access. We have been assured that the new labels should start showing up on store shelves and their website in the next couple of months. Your concern, messages, and sharing helped to make this happen — thank you! We will continue to keep you updated on any further progress with Nuts ’N More, as well as the other companies we are in contact with. In the meantime, you can help to further the effort to encourage all manufacturers to provide this important information and awareness by signing and sharing our two petitions. Help us improve labeling of products that contain xylitol by signing and sharing these two petitions— one is to the FDA, the other is directly to the manufacturers.